The 322 Motor Yacht expanded on Silverton’s signature “Side-Walk” design—a full-beam salon configuration with twin ascending staircases instead of side decks. This was a new concept in small motor yacht design, one that produced greater interior volume than many thought possible in a boat this size. Indeed, with two double staterooms, two heads, full-service galley, and a spacious, full-beam salon with convertible settee and dinette the Silverton 322 is probably the most spacious 32-footer ever built. 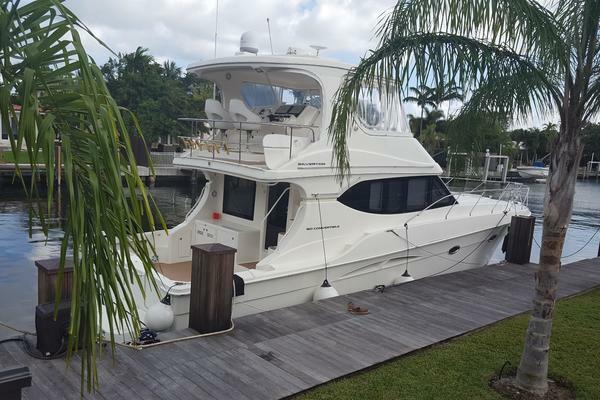 In addition to her vast interior, the 322 features a roomy flybridge as well as a small aft deck with wet bar and hardtop. Foredeck access from the flybridge is excellent with wide, molded steps and sturdy rails, and a curved staircase provides easy boarding from the swim platform. A huge sales success for Silverton. Built on a modified-V hull with a wide 12-foot, 4-inch beam, twin 300 hp MerCruiser gas engines cruise at 15–16 knots (mid 20s top). This vessel has been in possession of its current owner for 2 years. He has put approximately 70 hours on the engines. New bottom paint, zincs, prop shaft seals and engine service completed on 4/26/2018. Aft stateroom is furnished with a full-size berth, hanging locker, and Vizio flat screen TV. The stateroom is furnished with an en-suite bath facility equipped with a shower stall with shower door, vanity with sink mirrored medicine cabinet, and an electric-flush toilet. The forward V-berth stateroom is furnished with a full size berth, hanging locker, and a Samsung flat screen TV. The main salon is furnished with a port side tan vinyl sofa and a starboard side tan vinyl sofa and coffee table, and a Samsung flat screen TV. 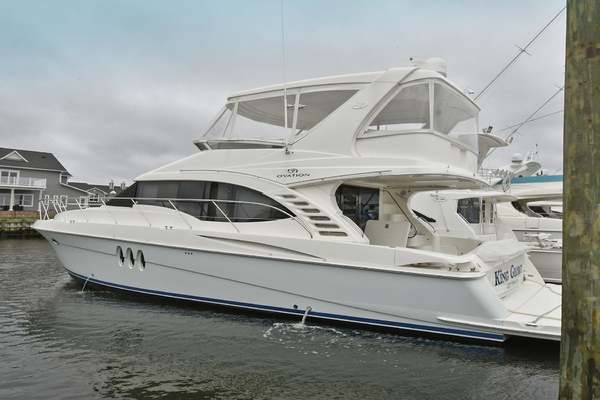 The galley is located on the port side forward of main salon equipped with a Princess two (2) burner stovetop, Frigidaire under counter refrigerator, Frigidaire microwave oven, galley sink, and plentiful storage cabinets. There is a forward bath facility equipped with an electric flush toilet, enclosed shower stall with lexan shower door, vanity with sink, and a mirrored medicine cabinet. 12 volt cabin lights. All lights are operable. Marine Air Systems 16,000 BTU air conditioner and a Marine Air Systems 9,000 BTU air conditioner. The Marine Air Systems air conditioner units are reverse cycle for heat. Clarion AM/FM/CD player and stereo with speakers. Vessel is equipped with below deck fish boxes, port and starboard flush mounted gunwale fishing rod holders, and Taco Grand Slam outriggers and has a built-in leaning post with live bait well, transom door and fresh and salt water wash downs. There are white vinyl bolster helm chair and white vinyl bolster observer's chair, forward port and starboard white vinyl passenger seats, and white vinyl passenger seat forward of center console, featuring a refrigerator, icemaker and 2 deck chairs on the aft deck. Canvas includes front and rear eisenglass panels on the flybridge, hatch covers and helm cover. A scuba tank holder and a diving ladder are located at boarding door portside aft deck. Stainless steel bow pulpit and fiberglass bow plank with anchor chute and roller assembly. Provided by portlights, hatches. One (1) Bomar deck hatch forward above V-berth. Port and starboard opening portlights. Sliding windows in aft master cabin. Aft deck has scuppers at port and starboard aft corners. Appears serviceable. Stainless steel cleats located at strategic locations port and starboard. 12 volt anchor chain windlass. Inoperable. Deck surface has molded in non-skid. Two (2) engine room hatches and chain locker hatch. Stainless steel handrails along sides of cabin superstructure and others at various locations on vessel.  Appears adequate. There are a total of three (3) 12 volt Group 27 lead-acid batteries. The main electrical panel is fitted with designated 12-volt circuit breaker switches and voltmeter. C-Charger 12 volt 40 amp automatic battery charger. Port and starboard gasoline engines are equipped with belt driven 12-volt alternators. The generator is equipped with a 12-volt belt driven alternator. Two (2) Marinco 30 amp 125 V.A.C. shore-power inlets. 30 amp 125 V.A.C. shore-power inlet. Vessel is also equipped with a Kohler 6.5 KW generator powered by a fresh water cooled gasoline generator. The main 120 V.A.C. distribution electrical panel is fitted with designated circuit breakers for the 120 V.A.C electrical system and voltmeter and amp meter. Various A.C. outlets available throughout yacht are conveniently located. Twin Mercury 350 litre MPI 300 horsepower gasoline inboard engines. 300 horsepower, Eight (8) cylinders. Morse clutch and throttle controls. Main engine beds are heavy fiberglass engine bed stringers with through-bolted steel motor mounts. Power blowers with natural flow ventilation provided by cowl vents. 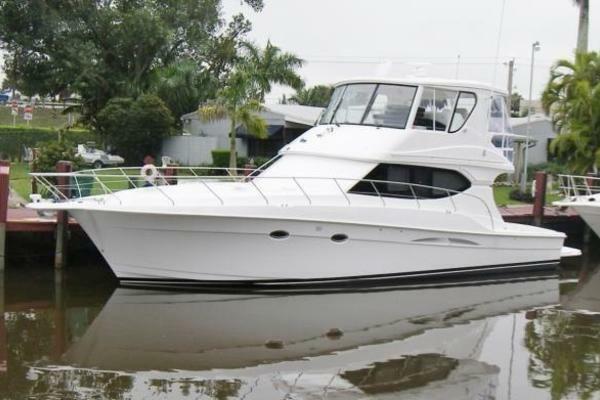 Our Silverton listing is a great opportunity to purchase a very nice 37' 322 Motor Yacht. 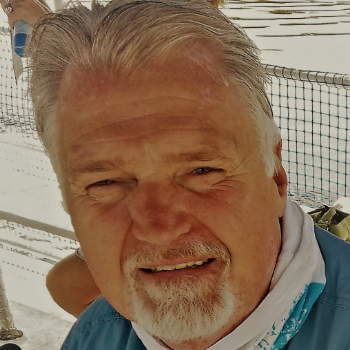 She is currently listed with United Yacht Sales broker Rick Furtado who can answer all questions about the boat for you. Please don't hesitate to reach out to our team of professional yacht brokers to schedule a showing. There are many yachts listed for sale on the MLS each with a different history. We look forward to helping you complete your search for the perfect boat or yacht for sale.